From left: Hauksson, Juliusson and Bartoszek. 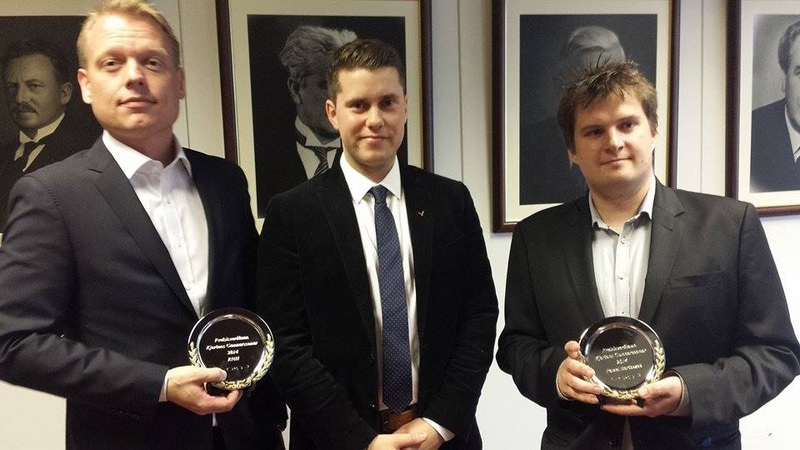 RNH has received the Kjartan Gunnarsson Freedom Prize for 2014, awarded by the Board of the Young Independents, SUS. The Prize is given annually to one institution and to one individual for their services to individual freedom. RNH received the institutional Prize for its contribution to research on the benefits of economic freedom. The Centre has, as the SUS Board recognises in its declaration, explored the causes of, and hindrances to, innovation and economic freedom. In its research, a special emphasis is put on the way in which individuals can by spontaneous cooperation, mutually beneficial trade instead of commands from above, fulfil their needs and improve their living standards. “RNH has organised several conferences and meetings and has invited to Iceland many foreign scholars and activists to participate in the Icelandic discussion and debate on freedom. RNH also does research on income distribution and taxation, resource management, environment protection, innovation and entrepreneurship. Moreover, RNH has made a powerful contribution to keeping alive the memory of those who lost their lives to 20th Century totalitarianism,” the SUS Board declares. The individual recipient of the Freedom Prize this year is Pawel Bartoszek, a frequent commentator on current affairs, the son of Polish immigrants to Iceland and a mathematician by training. Two members of RNH’s academic board, Professors Ragnar Arnason and Hannes H. Gissurarson, are among previous recipients of the individual Prize. On behalf of RNH, Gisli Hauksson, Chairman of the Board, received the institutional Prize from Magnus Juliusson, Chairman of the Young Independents, at a ceremony in Valholl, headquarters of the Independence Party, Friday 23 May 2014. The Prize is named after Kjartan Gunnarsson, an investor and former Executive Director of the Independence Party, who was and is well-known for his firm support of freedom.